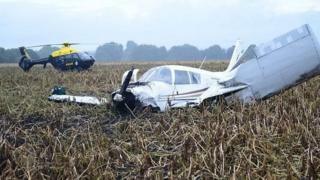 A pilot who claimed his handling of an emergency landing was so good that a film should be made about it has been convicted of breaching aviation laws. Robert Murgatroyd, of Poulton-le-Fylde, took off in a Piper PA-28 from City Airport in Barton on 9 September 2017. The plane, which was almost 500lbs over its weight limit, then clipped trees near the M62 and crashed in a field. The 52-year-old was found guilty of endangering his passengers and six more offences at Manchester Crown Court. The Crown Prosecution Service (CPS) said Murgatroyd, who holds a private pilot licence, was taking passengers on a birdwatching trip to the Isle of Barra. The court heard he charged his three passengers £500 each for the trip, filled the fuel tanks to capacity and then set off without making checks on the weight of the full plane and with the wrong flight manual on board. The aircraft was found to be 426lbs (193kg) over the maximum take-off weight of 2,150lbs (975kg). After crossing the M62 near the airport twice, the plane crashed into the field. The pilot broke his nose in the crash, one passenger suffered a cut to his hand; one suffered suspected cracked ribs and whiplash, while another suffered a serious cut to the head and severe bruising to his ribs. He is due to be sentenced at the same court on 15 March. Speaking after the hearing, the CPS's Nicola Wells said Murgatroyd denied he was responsible for the crash and made out he had saved lives. "In police interview, he described himself as a hero for the way he handled the forced landing and said that there should be a Hollywood film made about him," she said. However, she said his "reckless actions" could have had fatal consequences. "Out of pure greed he put his passengers, road users and anyone else in the area's lives at risk."